Fantastic Four #3: Reed’s Stretchy Body 4 | The Fantastic Flame On! 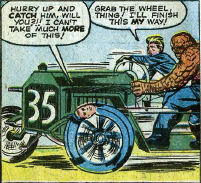 Escaping from a re-united Fantastic Four in the atomic-powered tank, the Miracle Man shoots out a tyre on the Four’s car with hypnotism with his gun. Ever resourceful, Reed contorts hit body into a tyre to allow the car to continue. The car, however, is an antique racing car that happened to be parked nearby, and you have to wonder how it manages to keep pace with the atomic-powered tank. Still, I like this use of Reed’s powers. It’s inventive, resourceful, visually interesting, and shows a little bit of his character as he points out that he can’t keep it up forever. This entry was posted on October 13, 2012 at 6:00 pm and is filed under Reed's Stretch Body with tags 1962, Art Simek, Fantastic Four, Jack Kirby, Mr Fantastic, Reed's Stretchy Body, Sol Brodsky, Stan Lee. You can follow any responses to this entry through the RSS 2.0 feed. You can leave a response, or trackback from your own site.